If you are missing one or more of your teeth, dental implants are generally considered the best way to replace them. This is because dental implants are the only missing tooth treatment that can actually replace the tooth root. Dr. Jorge Montane has the experience necessary to make sure you are a good implant candidate and to create a dental implant treatment that is durable and natural looking. If you are interested in implants or implant-supported dentures, please give us a call at 510-795-0444 to schedule your free initial consultation. Tooth root replacement is important because without it, the jaw bone may shrink, leading to the sunken look of many denture wearers. 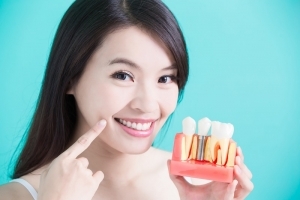 The tooth roots play a vital role in keeping the jaw bone healthy and strong. If you are missing most or all of your teeth, there's no need to place an implant for every single missing tooth. Implant-supported dentures can be done with anywhere from two to five implants, which the denture clips securely onto. Implant-supported dentures are a better choice than regular dentures because they are more secure, more durable, more comfortable, and easier to talk and eat with. Ask Dr. Montane if a bridge or an implant would be better for you. Dental implants are a surgical procedure, and the full process can take up to 6 months. This is because after the implant is placed, time is needed for the implant to fuse properly into the jaw bone (osseointegration). After the implant has successfully fused, your custom crown can be placed. Some patients may need a bone graft before having an implant placed. Bone grafts are generally needed if there is not enough existing bone density in the jaw for the implant to be able to fuse. If you need a bone graft, your implant process will take a little longer. Recovery after having your implant placed is generally fairly easy. We will prescribe medication for any pain or discomfort, and you may want to stick to soft foods for a few days. Dr. Montane will give you more detailed recovery instructions and let you know what to expect. If you are interested in dental implants or implant-supported dentures to replace missing teeth, call Dr. Montane today at 510-795-0444 to schedule your consultation. We serve patients in Fremont, Newark, Union City, and other nearby areas of California.